You have to admire Sacramento. After decades of being in San Francisco’s food shadow, a couple of years ago the city declared itself America’s Farm to Fork Capital. And why not? It’s the capital of the biggest food-producing state in the nation, it’s surrounded by farms that grow year-round, and it has the largest certified farmers’ market in California. 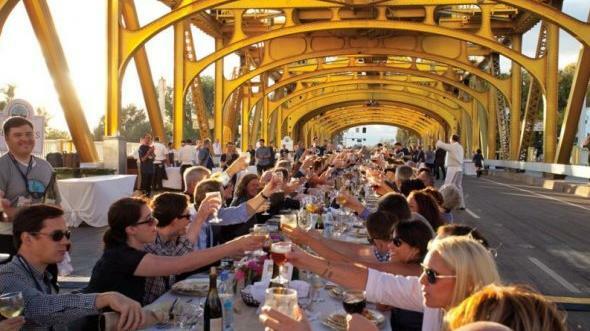 The Farm-to-Fork campaign includes a showstopper annual dinner for 600 on the city’s Tower Bridge, a cattle drive on the Capitol Mall, and now Foodstock, a music event with a pig roast. A farm-to-table lunch at Waterboy restaurant, December 8, 2014. Last week, at a lunch with several Farm-to-Fork chefs at the city’s excellent Waterboy restaurant, I had a taste of just how good Sacramento food has become, and why. We’d­ been invited there by Craig McMurray of Capital Public Radio, a major station and also an emerging force in the sustainable food movement, with its own large edible garden. Piping-hot potato leek soup at Waterboy. Chef Rick Mahan’s gnocchi with braised pork, butternut squash, and mushrooms. As if to prove his point, dessert arrived— a fabulous almond cake dolloped with cream and sugared cranberries. Dessert at Waterboy: almond cake with cream and sugared cranberries. It’s Sacramento, so it was hard not to comment by quoting the Governator. But most definitely…I’ll be back.